Hungarian Prime Minister Viktor Orban faces being kicked out of Europe's largest political group after months of anti-EU rhetoric. The centre-right European People's Party (EPP) has started an exclusion process which would remove him and his Fidesz party from the group. Twelve political parties in the EPP requested the move, which will now go to a full vote in two weeks' time. It follows months of tension between Mr Orban and some of his EU colleagues. 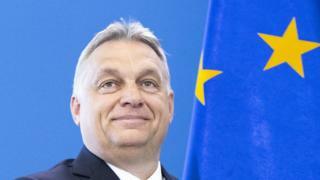 Recently, Mr Orban's anti-EU rhetoric has targeted senior members of the EPP - the EU's main conservative bloc. His party commissioned posters featuring EPP member and European Commission President Jean-Claude Juncker, alongside a photograph of Hungarian billionaire philanthropist George Soros – who is frequently the target of conspiracy theories and anti-immigration rhetoric. It was captioned "you have a right to know what Brussels is preparing" and accused Mr Juncker of pushing a pro-immigration plan backed by Mr Soros. "The European People's Party is a big family that can have their differences," EPP President Joseph Daul told German newspaper Die Welt. "But there is a limit and Viktor Orban has crossed the red line." Who is billionaire financier George Soros? Image caption Opposition activists defaced posters to read: "You have a right to know what Orban is preparing"
Mr Orban, however, called those who were calling for his removal from the EPP "useful idiots". In an interview with Sunday's edition of Die Welt, he suggested that the political left was orchestrating events to damage the EPP – and those calling for his removal were unwittingly serving that interest. Mr Orban's government has pursued a fiercely anti-immigration and nationalist agenda which has left it isolated in Europe and facing disciplinary action from the European Parliament. He remains popular in Hungary, having secured a third term in office and a majority in parliament for his Fidesz party in last year's election. However, recent protests against working conditions were a rare demonstration of widespread discontent. His position in Europe has been strengthened by being a member of the same grouping as other mainstream conservative political parties, including Angela Merkel's CDU party in Germany – which has not yet called for Fidesz's exclusion. The EPP is required to debate the exclusion of a member once seven parties formally request it, but that number swelled to 12 parties from nine countries by Monday evening, the group said. There are 80 members of the EPP, but the group's regulations say exclusion is decided by its political assembly - composed of some 260 individuals from the party leadership and selected delegates from its member parties and partners. Mr Daul told AFP news agency: "The decision rests with all EPP members and I cannot anticipate the outcome of the discussion." Mr Orban's anti-immigration campaign and the EPP's firm response both come ahead of the European parliamentary elections in May. Nationalist and anti-immigration parties including Mr Orban's Fidesz and the Italian League are hoping to win an increased number of seats and upset the power balance in Brussels. The overall number of seats is also set to drop by more than 40 in the 700-plus seat parliament if the UK successfully leaves the EU as planned on 29 March.